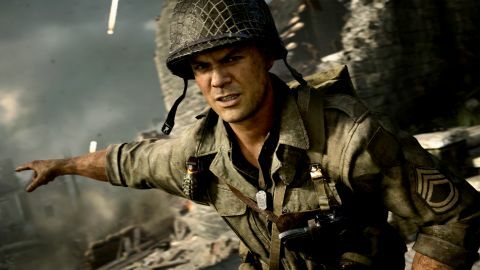 Call of Duty WW2 review: "Getting rid of the gimmicks creates a much purer point and shoot experience"
Big changes this year for Call of Duty. The series has abandoned its literal arms race into the future, and returned to its World War 2 roots. And, for the most part, it delivers a well rounded package with multiplayer benefiting most from a clearer palette of gear and options that make maps and clashes more accessible and enjoyable than they’ve been in years. Elsewhere, the single player has a few minor issues at the start but pulls everything together for a decent conclusion. It’s only zombies that disappoints a touch, simply because it’s exactly the same. After those teasing trailers and promises of something new, this is the usual wave-clearing, power-up-chasing game. Fun as ever but why make such a fuss if so little has changed? It’s wiping the slate clean on guns and gear that really reinvigorates things this year. As good as the more recent futuristic stuff has been, it has all blurred into one big mush of space weapons and drones - one part shooting to two parts that bit in Minority Report when Tom Cruise starts putting his fingers all over the screen. It was great at the time but increasingly felt like it was building a world where the presentation of the trigger pull became more important than the act itself. Stripped of all that, WW2 has nothing but a trigger pull and, if you’re lucky, a hit. It creates an online game built from player skill and spacial awareness with little in the way of barriers between you and your actions. Before, it could feel like gear selection or loadout choices could make a big - maybe slightly cheaty - difference, now it’s more about learning the maps and being ready. Getting rid of the gimmicks creates a much purer point and shoot experience. There are still scorestreaks and gadgets but it’s a more level playing field in terms of advantages. Divisions form the backbone of the new class system: Infantry, Airborne, Armoured, Mountain, Expeditionary, which roughly equates to soldier, assault, heavy, sniper and ‘that guy with the flaming shotgun.’ While you can use pretty much whatever gear you want, each Division has a series of specific abilities to unlock that will hopefully suit how you play. So Airborne are faster and can sprint longer, Mountain are invisible to most things and move silently, Armoured take less explosive damage and so on. They’re traits that flavour play rather than define it. Aside from these changes, much of the core multiplayer will be familiar, with modes like TDM and Hardlink, but there are couple of new things. Like Gridiron, a version of Uplink more fitting for the WW2 setting. Think American Football with guns as teams fight to get a ball into each others scoring zones. Without boost jumps and wall runs this is much more of a park kickabout, and a riot to scrap about in. The big additions this year are the objective-based War mode and Headquarters. War sees teams fight to protect/attack various objectives that pull you in a linear fashion through a multistage series of changing goals. There’s D-day, a tank convoy set up and a battle through a village to destroy some artillery. Playing these more involved maps adds some welcome depth. The shifting targets and tactics add texture and a variety of pace, but more maps are definitely needed - the small selection on offer get familiar fast. Headquarters, on the other hand, probably says the most about COD’s future. Despite Activision’s reluctance to say it outloud, it’s Destiny’s Tower in all but name. Although it could actually teach Guardians a few tricks about what to do with their downtime. Set on a D-Day inspired beachfront various characters and vendors let you take on challenges, customise characters and gear, or test weapons and scorestreaks. Then there’s The Pit, a 1v1 arena, where you can go toe-to-toe with others. That’s using anything from the usual guns if you want to be sensible, right though through to shovels and rocket launchers if you fancy a laugh. And you will try them because it never stops being fun. That just leaves Zombies on the multiplayer front. It’s as good as ever and, if anything, returning to its Nacht der Untoten roots. Like the very first undead mode this is dark in tone: full of gristle, wetly translucent skin flaps, and adding in metal armatures and surgical nastiness for a more sciencey feel to everything. Art style aside, though, it’s exactly what you’d expect as you kill zoms to gain currency to buy guns, power ups and unlock new areas. There’s a more obvious narrative element drawing you through this time, with objectives that suggest where you should be going but otherwise it’s undead business as usual. Single player this year very much delivers a greatest hits of ‘war things you’ve probably seen on TV’. Beach landings, that bit from Band of Brothers where all the trees explode, shootouts through French towns, German cities bombed to rubble. From moment to moment it plays well, full of spectacle and action, but does struggle though a slightly disjointed first half. There’s a sense that maybe things needed fixing at some point from the way certain parts fit together. A character featured in early art is on screen for seconds but focused on like he was meant to mean more. You can ‘rescue’ soldiers in every level, but only in one of two ways and a French resistance fighter still thanks you with an American accent. The much hyped mechanic where you need your teammates for ammo, health and so on also feels like an idea in need of a home, rather than a necessary new concept. It’s fine when it works, but if you need a medical pack and the health guy’s not around, then you basically have to go off looking for him. The campaign progression feels a little mashed together initially too - from a classic European assault opening you’re very quickly helping spies and the French Resistance chase a train, finding a defecting officer and, later on your own, helping rescue civilians. It’s only after the story has cleared this tumbling attempt at variety that any real feeling of momentum coalesces as the final half develops a clear head of steam towards a decent conclusion. Weirdly, for a story about one of the most famous wars in history, this does a poor job of telling you what’s actually going on. The old Call of Duty World War 2 games always made it clear that the Allies were doing this, the Axis were doing that, and here’s what’s at stake. Here it feels like the script was just ‘war stuff happens’ written repeatedly over the page. I didn’t care much about the characters until the end because they didn’t do anything meaningful until then. They might as well have just walked around repeating ‘I’m the one you’re meant to care about,’ or ‘I’m the angry one with a troubled past’ and so on. The writing’s functional more than anything else, with the exception of one expositional encounter that’s so badly done I laugh-gasped out loud. It’s ‘parody show inside a show’ awful. From moment to moment, though, the campaign is solid, unwavering fun with some great set pieces and moments. Taking a step back really exposes the single player as a collection of good levels and ideas strung together, rather than a narrative. The experience overall though is good and, with such an enjoyable and varied multiplayer offering, everything ultimately balances out.